So you’ve mapped out your dream route, made a list of the sites you must see, and can’t wait to try out some of these delicious s’mores recipes. The only thing missing from your epic adventure? The perfect fifth wheel. Deciding on a fifth wheel is an easy choice–with the size and spaciousness offered, you know you’ll be comfortable and the stability of the hitch will make the drive easier for even first time RVer’s. But deciding which fifth wheel to buy is a little more difficult. With a price range anywhere between $30k to over $100K, figuring out your budget is probably the most important. While you’ll likely get the space no matter the price, deciding which features you absolutely cannot live without will determine the price of the fifth wheel you want. Are you looking for standard comfort in a fifth wheel that gives you just the necessities? Or do you want it all? Shiny, stainless residential appliances, washer and dryer, a master suite fit for a penthouse? Consider which features you can sacrifice to stay within your budget and which you won’t budge from and you’ll be in a better position to drive away with your perfect fifth wheel. It’s not just the ticket price to take into consideration. If the tow weight is on the lower end, you might able to get by with a half-ton truck. But more than likely, you’ll need a truck with a higher towing capacity, and maybe even a change to your budget. Tip: decide on the fifth wheel first so you know what to look for in a truck, this will be your living space for the journey and your satisfaction with it will be the ultimate factor on value. While price tends to dominate the decision on which fifth wheel to buy, there are other factors to consider when choosing a fifth wheel. Deciding how many people will be traveling with you will help you determine if you want sleeping space that is set, like a bunkhouse, or are comfortable with setting up the sleeping space each night with hide-away furniture. Inspect the fifth wheel just as you would a new house: open and close cabinets, switch on the lights, check the location of outlets–make sure the features you want are in places that work for you. 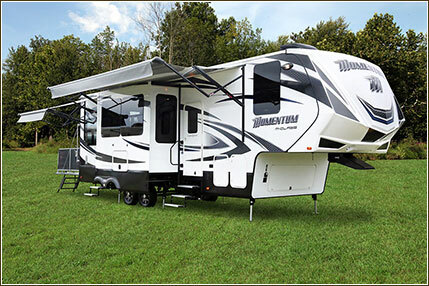 Determine the features you want and stick to that as closely as possible–you don’t want to end up with a fifth wheel that just doesn’t work for you. But, stay flexible in other areas that may not make that much of a difference in the long run. If you can’t find the perfect fit in a new fifth wheel, take a look at the used options. And take into consideration if something you aren’t crazy about in the fifth wheel can be changed–such as decor, or the paint package. If you’re in the market for your next fifth wheel, or still daydreaming about heading out on your first RV adventure, visit one of our two locations and our staff will do their best to answer any questions you may have.